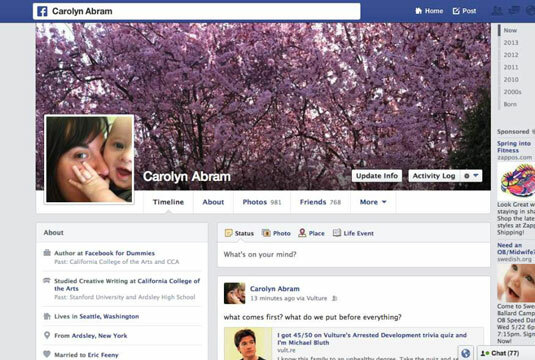 The Facebook Timeline has a few different portions: the big cover photo and the smaller profile picture, the navigation tabs beneath the cover photo, the About box, the Share box, and the Timeline itself, extending from the present back and back and back to the day you were born. In terms of navigating the Timeline, the most important thing to know is that you scroll down the page to go back in time. As you scroll down, posts you and your friends have made and life events you have added keep on showing up. When you start scrolling down, a new menu appears at the top of the page. This is called the Timeline navigator. Timeline: This drop-down menu lets you switch from the Timeline itself to the About section of your Timeline. Year: This drop-down menu lets you hop from year to year on your Timeline. Highlights/Month: By default, when you scroll back in time, Facebook shows you Highlights — what it thinks are the most important posts or events. You can use the Timeline navigator to change from Highlights to All Stories. When you switch to all stories, you can use this menu to view specific months within a certain year.